This tobacco-free blend was created to solicit the favor of Tatha, an ancient goddess of Scotland. Keeper of most famous river, Tatha on whose shore an ancient Druid prophet was divinely presented the original blends. 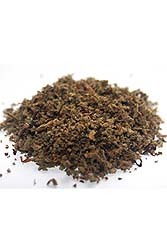 Ingredients: Mugwort (the dominant herb by large measure), with dashes of Celadine, Betony, Catnip, Woodruff, Wormwood, Damiana, Skullcap, Sweet cicely, Wild Dagga, Pygeum, Buchhu, Wild Lettuce, Valarian, Spikenard, Blue and White lotus petals, pre-ooaked in a special blend of herbal extracts and precious oils.